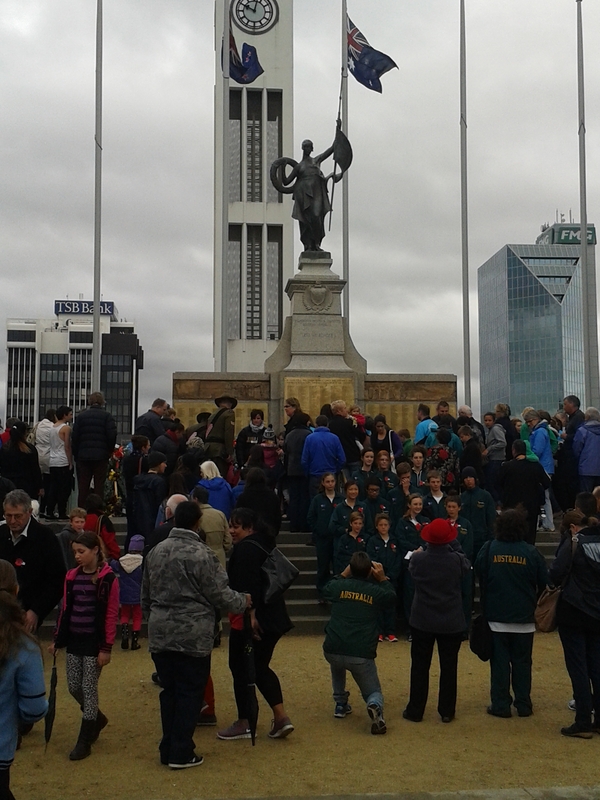 With no set plans or agenda for the day off, I woke up on Friday, 25 April and spontaneously decided to observe the local Palmerston North ceremony and commemoration for Anzac Day. Similar to ceremonies and observances held in cities and towns all over New Zealand and Australia, the ceremony I attended remembered the lives and sacrifices of New Zealanders and Australians who served in wars. Anzac is an acronym for Australia New Zealand Army Corps and the day was originally observed in both countries to remember the horrific loss of lives of Australian and Kiwi soldiers who landed at the Gallipoli Peninsula in the Ottoman Empire on April 25, 1915. The campaign dragged on for months and thousands of soldiers from New Zealand, Australia, the UK, France, British India (all fighting for the Allied forces) as well as countless enemy Turkish soldiers fighting for the Ottoman Empire, died in battles. News of the Gallipoli battles made their way back home and had a heavy impact on the morale and national psyche. Impromptu observances were held already in 1915 and the first official Anzac Day was held on the first year anniversary of the April 25th landing at Gallipoli. Today, almost a century on, the Gallipoli campaign has become for both Kiwis and Australians a symbol of almost legendary proportions as well as national pride and sacrifice. Following World War II, Anzac Day became a day to remember the sacrifices and lost lives of Kiwi and Australian men and women who have served in all wars and conflicts. As I walked on the almost empty streets of Palmerston North to make my way to the cenotaph and war memorial in the town square, I reflected on what I hoped to achieve attending the Anzac Day event. What could I, a newcomer, whose identity here as an “American” is given away as soon as I open my mouth and the flat toned accent rolls off my tongue, gain from going to the ceremony? As a relative newcomer to New Zealand, I was curious to observe how the symbolic day would be marked and as such try to understand its significance to ordinary Kiwis. I am grateful to New Zealand for welcoming me here, recognizing my relationship with my partner and allowing us together to have the opportunity to live, work and enjoy life here with relatively few obstacles. Perhaps in some sense, I felt it was my duty to witness and take part in the day and pay my respect to those who sacrificed their lives so that I could build my life here today. In addition to paying my respects; understanding its significance to my Kiwi neighbors and the community; I think I also hoped that in some small sense, participating in the Anzac Day ceremony would help me feel more integrated and closer to feeling more at home here and at least for a few moments, identify with being a Kiwi. While attending the Anzac Day community ceremony, I was indeed overwhelmed with emotion. Unexpected tears welled up in my eyes as I walked up to join the crowd and we started to sing Amazing Grace, a song so familiar and sentimental to me and which I have always thought of as a true American anthem. I was moved by the words of the pastor who spoke to the crowd and reminded the community to remember those who had died, those who had come to our aid, and most poignantly to also remember enemies, as they too were bereft and had lost many loved ones. 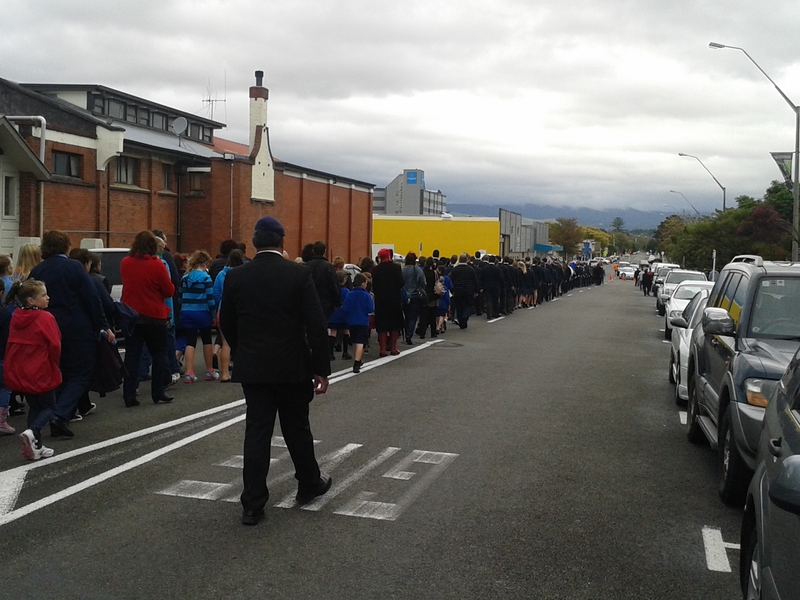 Within the crowd were families with young children, military personnel with their families, university students, older veterans, as well as attendees from all communities including Maori, Pacific Islanders, and various immigrant and national communities. Following the pastor’s sermon, various members of the community were called upon to place wreaths on the war memorial. Uniformed veterans of different wars or family members were first called upon, following members of different community organizations and schools. High schoolers as well as primary schoolers all proudly represented their schools and community and placed wreaths on the war memorial. Regional foes in conflicts over the last couple of centuries, the Greek and Turkish communities of Palmerston North symbolically placed a joint wreath together at the end of the wreath placing ceremony. The ceremony ended with a moment of silence, a military gun salute and the singing of the New Zealand national anthem. Following the ceremony, the participants in the wreath placing marched out on the middle of the square and along its periphery while the crowd followed and clapped. Whereas my informal participation in Anzac Day did allow me to understand firsthand the significance of the day to New Zealanders, I couldn’t help but reflect on the implications of such as day back home in the United States. While I’ve always considered many Americans to be patriotic, involved in their communities and politically active and engaged, I believe that a day such as Anzac Day in the US does not seem to have the same significance as it does for Kiwis. While it’s true that Memorial Day and Veterans Day are observed in the US, I personally have never felt any overpowering sense of importance leading up to those days such as here. Americans seem to participate at the same level of involvement and engagement on the Fourth of July (Independence Day) but curiously do not come out in the same numbers for Memorial Day or Veterans Days. Rather, these days seem to be embraced simply because they give Americans much needed long weekends or allow retailers an excuse to lure consumers to holiday sales (of course the same might be said for here). Perhaps the US is too politically divided and its current involvement in wars has made more active participation and greater involvement in the day a thorny issue for many Americans. I learned that throughout the last century, Anzac Day ceremonies have also seen their share of protests and controversies in Australia and New Zealand but in recent years, the political implications have been overlooked to remember the lives of all victims of wars and to offer gratitude, united comfort and closure to those who fought as well as their families. Perhaps someday when the US is also more removed from its conflicts, Americans too will more willingly embrace and offer similar sentiments for the men and women who have served the country in the armed forces. As I was at a remembrance day event and my emotions were raw, my mind began to wander and remember people no longer with us. April 24, 2014 marked what would have been the 100th birthday or my grandfather George Ball Stephan. He was and still is an important part of my life. I also remember the life of a neighbor who recently passed and left this world too soon. He and his wife were once only briefly in my life but I remember him for being part of my life at one point and my heart goes out to his wife and two daughters.